Former FBI chief James Comey said Donald Trump is unfit to be president of the United States "on moral grounds"
Comey’s remarks are the latest salvo in a war of words with Trump, who excoriated the former FBI director on Twitter earlier in the day, again calling him a “slimeball” and suggesting he should be jailed. The wide-ranging interview with ABC News also came ahead of Tuesday’s release of Comey’s memoir, “A Higher Loyalty: Truth, Lies and Leadership,” in which he details his interactions with the Republican president. “I think he’s morally unfit to be president,” Comey said, in his first televised interview since being fired in May last year. Comey also said that serving in Trump’s administration poses a serious ethical dilemma. “The challenge of this president is that he will stain everyone around him,” he told ABC. In the book, Comey likens Trump to a dishonest, ego-driven mob boss and says he demanded the then FBI chief’s personal pledge of loyalty — a damning account that has infuriated the president at a moment of intensifying legal pressure on other fronts. “I never asked Comey for Personal Loyalty. I hardly even knew this guy. Just another of his many lies. His ‘memos’ are self serving and FAKE!” Trump said in a tweetstorm fired off Sunday before the interview. The president said he “stupidly” handled a probe into Trump’s 2016 election rival Hillary Clinton and how she used a private email server during her time as secretary of state. In another tweet, the president offered a mini-review of Comey’s memoir. The jumble of references appeared to allude to unsubstantiated accusations Trump has previously made claiming Comey lied in Senate testimony last May in denying he had served as an anonymous news source. In the interview, Comey said he was unsure whether or not the Russians have compromising material that could be used to blackmail Trump — either relating to his pre-election personal conduct, or his campaign’s actions. “I think it’s possible. I don’t know. These are more words I never thought I’d utter about a president of the United States, but it’s possible,” he said. And Comey said the president may have obstructed justice when he asked him to drop an investigation into former national security advisor Michael Flynn. Trump and his aides have countered Comey’s media blitz by attacking his handling of the probe into Clinton’s emails. Comey acknowledged in the ABC interview that his belief that Clinton would be elected president “was a factor” in his decision to reopen the email probe 11 days before the US election, a development that Clinton blames for her surprise defeat. 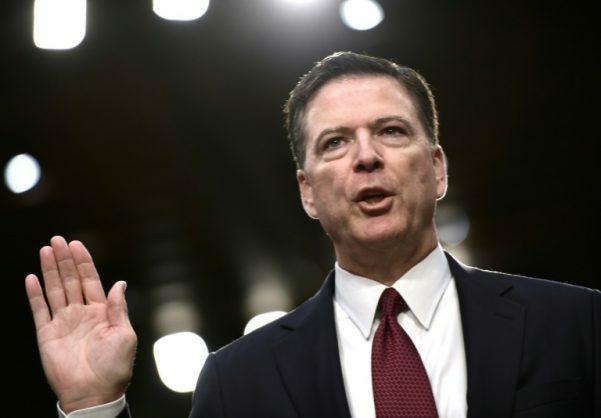 “I don’t remember spelling it out, but it had to have been, that she’s going to be elected president and if I hide this from the American people, she’ll be illegitimate the moment she’s elected, the moment this comes out,” Comey said. Trump attacked him on Twitter. “Unbelievably, James Comey states that Polls, where Crooked Hillary was leading, were a factor in the handling (stupidly) of the Clinton Email probe,” Trump said. “In other words, he was making decisions based on the fact that he thought she was going to win, and he wanted a job. Slimeball!” he wrote.